Email is a pain and still I notice that many users would like to receive an email if there is an alert with a host or service. As slack is getting more and more popular it might be a good idea to send the alerts to a Slack channel instead. This is quite easy to do. Start by creating an incoming webhook integration in your slack and note down the URL. Choose what channel to post to. Copy the url. And save. Visit the page below and download the script. Read any documenatation there. When done open it up and modify it like below. Insert your own url and change channel and eventually botname. 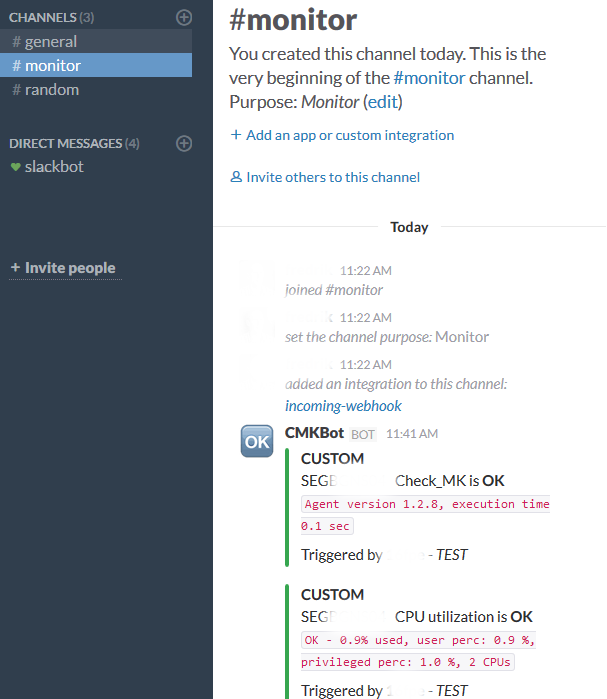 slack_path = "/services/T2STVDFGQR3/B2YTRES5S/g5ew91AVSTSFSSRS4fJlcL" channel = "#" + os.environ['NOTIFY_PARAMETER_1'] if not channel: channel = '#monitor' bot_name = "CMKBot"
Open WATO and create a new user called slack. Create a new rule like below. Choose what hostgroups and other parameters you may want. Save and commit. Wait for something to happen. Or add members to your new slack monitoring channel.